For Cash, Murderer Leads Police To Victims' Remains Authorities in California are excavating the gruesome remains of murder victims who were buried many years ago by a pair of convicted murderers dubbed the "Speed Freak Killers." The case raises some thorny ethical and legal issues: Should convicted criminals be able to benefit from their wrongdoing? 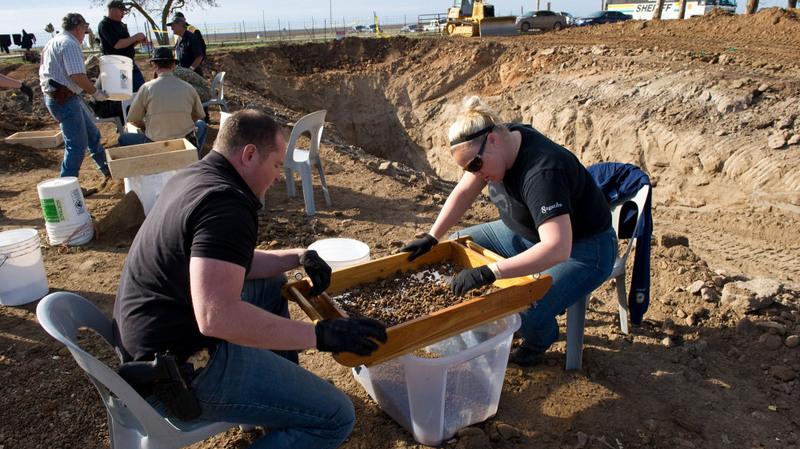 San Joaquin sheriff detectives sift for human remains that were excavated from an abandoned ranch near Linden, Calif., on Sunday. Authorities say Wesley Shermantine and Loren Herzog wantonly murdered an unknown number of victims before their arrest in 1999. Now, one of the convicted killers is leading investigators to burial sites that have yielded hundreds of bones. In California's Central Valley, authorities are excavating the gruesome remains of an unknown number of murder victims who were buried many years ago by a pair of convicted murderers and drug users. The search began last week after one of the convicts agreed to lead authorities to the remains in exchange for cash. But, the case raises some thorny ethical and legal issues: Should convicted criminals be able to benefit from their wrongdoing? The bells of Holy Cross Catholic Church punctuate an uneasy calm in the sleepy farm town of Linden, about an hour south of Sacramento. It's a tightly knit community of fewer than 2,000 people where everybody knows each other and everyone knew the convicted serial killers, Loren Herzog and Wesley Shermantine. Father Robert Silva says many of his parishioners have talked with him, in hushed tones, about the pair of killers who brought notoriety to their small town more than a decade ago. "They'll only tell you so much because they've known these families, but they're very protective, for example, of the little children of those families, the parents of those families," Silva says. "And they'll only say so much and then they shut down; they won't, they don't, talk too much about it." Perhaps that's because no one is sure how many bodies investigators will find. They have dug out one abandoned well and plan to move on to another on the same property on the outskirts of town. "Well, I've been in this business over 30 years and this is the most gruesome crime scene that I've been involved with," says Les Garcia, the spokesman for the San Joaquin County Sheriff's Office. "It's just unreal." Garcia says investigators have found evidence of a mass grave, including more than 1,000 bone fragments, purses, coats, shoes, jewelry and other personal items. Authorities have identified the remains of two women buried on yet a third property that had once been owned by Shermantine's family. We don't want criminals to benefit from their wrongdoing. On the other hand, we want the sense of closure, we want the information, we want the location of remains. Shermantine and Herzog, his boyhood friend, were arrested in 1999 and eventually convicted of killing four people, although officials suspect they may have killed more than 20. Herzog committed suicide last month, apparently after learning that Shermantine, who is on death row, planned to tell authorities where their victims' remains could be found. Shermantine drew maps of the locations of the graves after a bounty hunter promised him $33,000. More than half of that money will be paid in restitution to the victims' families and some will pay for headstones for Shermantine's parents. Whatever money remains is available for the inmate's personal items, including junk food and a TV. "All of this becomes unusual because the currency isn't penal leniency," says Frank Zimring, who teaches at UC Berkeley's School of Law. What's much more typical, he says, is that a murder suspect would agree to share information in exchange for a lighter sentence. Zimring says this case presents a clash of two public sentiments. "We don't want criminals to benefit from their wrongdoing," he says. "On the other hand, we want the sense of closure, we want the information, we want the location of remains." California's state prison officials have declined to comment on the case, saying they don't want to interfere with an ongoing investigation.